The Croft Mine Historical Park in Crosby, Minnesota preserves the headframe and railroad bridge. Mining on the range continued until 1984. Also like the Vermilion Range, mining slowed as it became more economical to extract taconite deposits from the Mesabi Range, which were closer to the surface. Additionally, the surface mines were safer than the mines deep underground. The main iron ore bearing formation is the middle Precambrian Trommald Formation, which belongs in the Animikie Group. This is a chert containing oxidized iron in the form of hematite and goethite. Some clastic quartz sands and argillaceous layers. 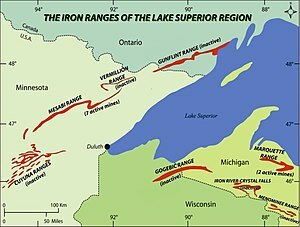 :18-25 The agate variant Binghamite is found only in the Cuyuna Range. ^ a b c d e f Schmidt, Robert (1963). Geology and Ore Deposits of the Cuyuna North Range Minnesota, Geological Survey Professional Paper 407. United States Government Printing Office. p. 3-4.